Clockwise Sierra de Ronda near Gaucin. wetlands of Doñana Park, a UNESCO World Heritage site. Almeria’s desert landscape, used as a location for Series 6 of Game of Thrones. Los Muertos beach in Almeria, with volcanic cliffs. 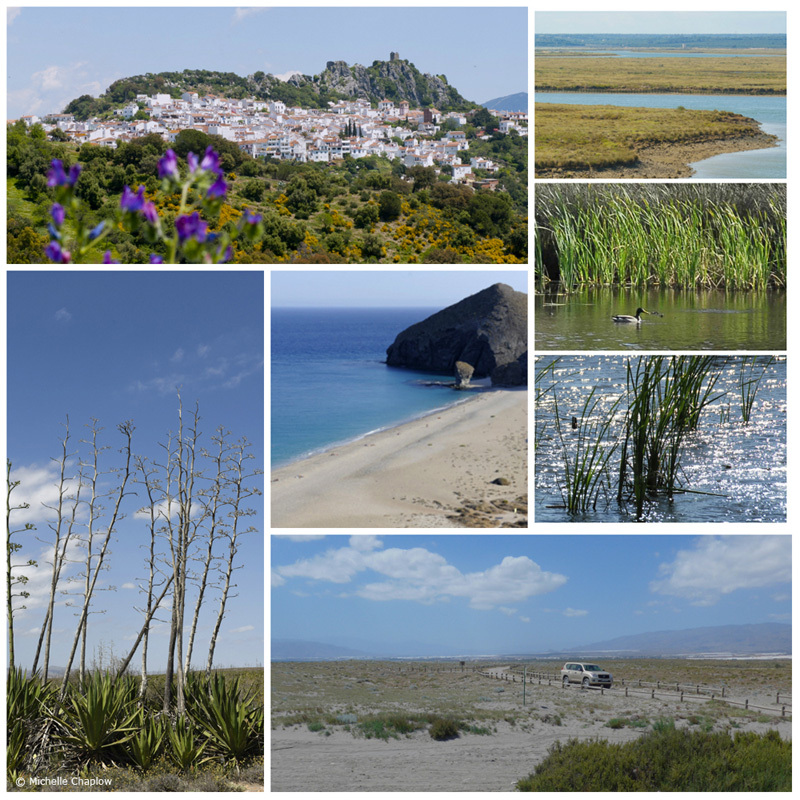 Those of us who are fortunate enough to live here in Andalucia will be aware (well, most of us – some never venture beyond the coast, which is their loss) of the wide and wonderful variety of Andalucia’s scenery. Each of the eight provinces – Almeria, Cadiz, Cordoba, Granada, Huelva, Jaen, Malaga and Sevilla – has much to offer. And if you’re planning to visit, hopefully this post will open your eyes to the extraordinary sights, the out-of-the-way places and stunning views you can enjoy while you’re staying in sunny southern Spain. This region has the broadest range of landscapes of any region in Spain. Where else in the country (or indeed, in Europe) can you see, within a few hours’ drive, beaches, a desert and a snow-capped mountain? The wetlands of Doñana Park, a UNESCO World Heritage site. For nature lovers, bird-watchers and hikers, not to mention photographers, this terrain is heaven. You can admire rare birds such as the imperial eagle on the wetlands of Doñana in Huelva province, while the highest peak in the Iberian mainland, Mulhacen (3,482m) in Granada’s Sierra Nevada, becomes a popular skiing destination in winter. But if your bag is more relaxed, then choose from hundreds of beaches along the 1000-plus kilometres of coastline, from wide expanses of sand along the Costa de la Luz in Huelva and Cadiz to small, rocky coves along the rugged coastline of the Costa Almeria and Costa Tropical of Granada province. And that’s without all the celebrated Costa del Sol beaches of Malaga! The desert of Tabernas in Almeria offers such an extraordinary arid landscape, with flat, arid land as far as the eye can see, and bare mountains and that it has long been a popular location for filming movies and TV shows, most recently Game of Thrones and The Emerald City, and before that a number of westerns in the 1960s and 1970s. For more other-wordly rock formations, also featured on screen, El Torcal near Antequera is a craggy mountain scape which is well worth visiting. Indeed the most famous strangely-shaped geological feature in the whole region must be the nearby Peña de los Enamorados, which has the shape of Indian face in profile. In Andalucia, agriculture is integral to the landscape, as well as to gastronomy, economy and society, and in Jaen province you’ll see rolling field after rolling field with neat lines of olive trees. During spring time, and even late winter, soft pink almond blossom covers the land, especially in Cadiz, Malaga and Granada provinces. Another close connection between food and landscape is the hallowed jamon iberico. Black Iberian pigs feast on acorns as they graze on pastureland called dehesa, found in Cordoba and Huelva provinces. Driving across Andalucia from one side to the other, you’ll cross plains, mountains, desert, wetlands, river valleys, fertile plains planted with all sorts of crops – a scenic smorgasbord. Keep your eyes open, since in a region like Andalucia, it’s as much about the journey, as about the destination.